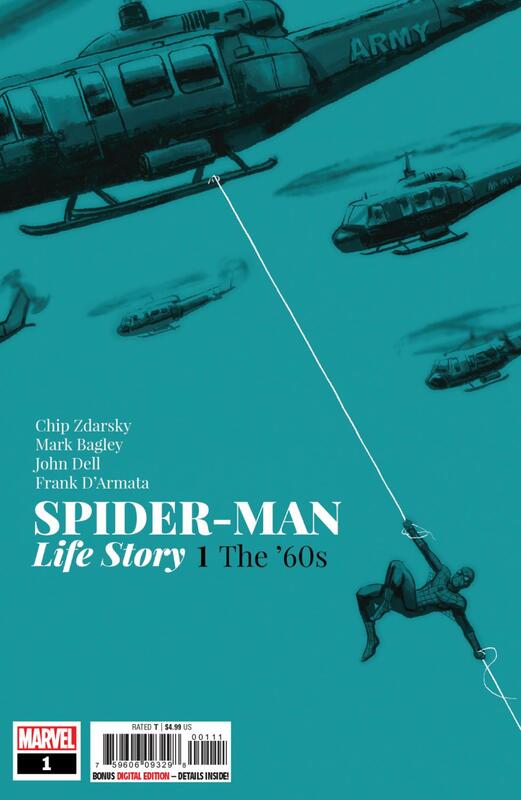 The idea of Spider-Man: Life Story has kind of scared me since its announcement. I am NOT someone who thinks Marvel comics should be apolitical, but the prospect of the web-head blatantly taking sides in historical moments since his debut wasn’t something I wanted to see. Thankfully, that’s not what this is at all. I mean, I should have known better than to be worried after Chip Zdarsky brought me to tears with the finale of his Spectacular Spider-Man run. This guy gets it. Life Story’s biggest problem so far is that its premise doesn’t feel all that important to the series yet, but we are on issue one, so I can’t really take off points for it. Yes, the Vietnam War plays a part in this story, and Zdarsky does a pretty good job emulating Stan Lee’s writing in a way, but I think you could really switch it out with another war in another decade and it would work just the same. There’s not much that makes this chapter feel like it must be told in 1966. It reads very much like a reboot of course, or kind of like 2016’s Spidey if it weren’t trying to be hip. Still, while I don’t think the setting was as important to the story as it could have been, I think it’s exactly how it should be. The most interesting parts of this book are when Peter has to take a step back to analyze just how far his responsibility as Spider-Man goes when taking into account his country and “obligation” to it. The matter is handled with class and feels one hundred percent in line with Peter Parker’s beliefs, even with nods as to how we know they will evolve. Mark Bagley drawing a Spider-Man that isn’t a teenager is always kind of weird to me, but of course it’s great. One of my favorite parts is the first two panels showing the spider bite transitioning to Peter shooting a web. The text makes me think that that was actually Zdarsky’s idea, but either way, the placement works really well. I sometimes think Bagley’s faces look too similar, but here he differentiates everyone greatly. Although I do wish the close-up shots would back off a bit. They’re sometimes a little too crammed. Nonetheless, the communication is always clear as day, so even though we’ve seen a young Spider-Man go against the Green Goblin many times, it’s easy to get behind Peter’s shock. Frank D’Armata’s colors make this book a lot more optimistic than it would feel otherwise. It helps sell the setting. It just wouldn’t feel like 1966 if it weren’t at least a little colorful. The practical lighting looks good and has smooth transitions, and when it’s mood lighting, it’s successfully elevating.